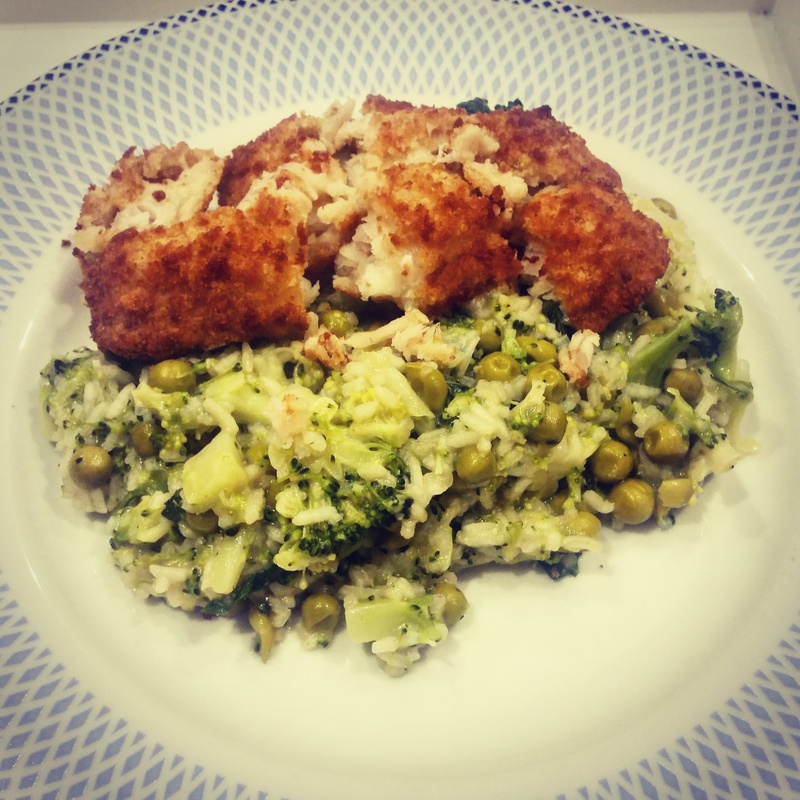 I am not really a huge fan of peas or mint but recently I wanted to use up some breaded fish fillets but was not feeling chips so opted to do a risotto. The idea of also having a meal full of greenery was pretty appealing as the remains of a chest infection has lingered on for a couple of months now and I keep thinking that eating well and drinking lots of water will perform a miracle (it has not yet). Start by cutting up a small brown onion and some garlic to put in a knob of butter in a pan to cook down. Heat the oven up to 200°c. Prepare vegetable stock either by reheating some you already made or making some from a stock cup. I tend to do about a litre of stock and use most ,if not all, of it but if you are unsure then it does not hurt to do more. Add the risotto rice into the pan with some salt and pepper. A lot of risotto rice packets have portion guidance on the side; try to stick to these because risotto rice is a bit like pasta where it can very quickly get out of control. Give that a good stir around and then add a ladle of stock in and turn the heat down to a simmer. When the ladle of stock has ‘disappeared’ add another ladle and keep repeating the process. Put the breaded fish in for the required cooking time, usually about 25 minutes, but this can depend on your oven and if you are doing them from fresh, defrosted or frozen. I find that from start to finish I can do a risotto in about 45 minutes including any preparing that needs doing anything in advance but have been known to do one as quickly as in 30 minutes so this is a fairly quick dish if you have confidence in risotto cooking. Chop the broccoli up into fairly small pieces as it will not be in the pan very long, and we all know there is nothing worse than soggy over cooked broccoli, and also either wash, drain or defrost your peas. The quantity of these depend on what balance of vegetable to rice you want, I find that I would rather put a little less rice in and bulk the meal up with vegetables otherwise bloating can quickly occur with all those carbs! When the rice is cooked, bit can still be classed as al dente, add the broccoli into the mix and add another ladle of stock. One ladle of stock should bring the rice to a softer texture and help heat through the vegetables enough but give it a taste and make sure it works for you. Take the pan off of the heat and mix in some chopped fresh mint as as well as a small amount of grated cheese. Serve it up with the breaded fish, which it turns out is harder to slice than I imagined, and tuck in. Fresh, green, fragrant and full of flavour. If you give this recipe a try or do anything that is similar to this recipe do let me know in the comments below, on twitter or on instagram as I would love to be able to try something new or make any tweaks to this dish. This entry was posted in Food and Drink, Recipes and tagged breaded fish, broccoli, comfort food, Cook, cooking, eating, fish, food, food blog, food blogger, food bloggers, home cook, home cooking, lblog, lblogger, lbloggers, life, Lifestyle, lifestyle blog, lifestyle blogger, lifestyle bloggers, mint, One pan dish, pea, pea and mint, pescatarian, quick cooking, Recipe, risotto, tasty, vegetable risotto, vegetables, vegetarian, vegetarian risotto. Bookmark the permalink.